Istanbulive: The Sounds & Colors of Turkey is an unprecedented event aimed at introducing Turkish music to the popular American consciousness. Mazhar Fuat Özkan (or MFÖ) has been an institution in Turkey for more than 30 years. With sentimental as well as humorous lyrics that speak to the lives of the Turkish people—and a richly harmonic folk-rock sound that has been compared to Crosby, Stills & Nash, and Simon & Garfunkel—Mazhar Fuat Özkan remains one of the most respected bands in Turkey. Painted on Water is the title of both the band and the ambitious new recording project featuring Sertab Erener, one of the most eminent voices in Turkish pop music, and Turkish rock star, Demir Demirkan, her producer, arranger and songwriting partner. The album, with lyrics in English, combines traditional Turkish folk song with American jazz, pop/rock and blues and features guest appearances by the likes of Al Di Meola, Kai Eckhardt, Tulug Tirpan, Dave Weckl and Trilok Gurtu. Vassilis Saleas is considered the foremost clarinetist in Greece. Best known for his work accompanying Greek new age instrumentalist Vangelis, Saleas is also a highly regarded solo artist in his homeland. He will be flying in from Athens exclusively to share the same stage with Hüsnü Senlendirici on this special occasion. Backing the two clarinetists will be NY Gypsy All-Stars, a non-stop party band steeped in the traditions of Turkish and Balkan music but equally fluent in contemporary jazz and dance. The group features clarinetist Ismail Lumanovski (born in Macedonia), bassist Panagiotis Andreou (from Greece), Macedonia native Seido Salifoski (on darbouka and dumbek), Tamer Pinarbasi from Turkey (on qanún), and Turkish drummer Engin Gunaydin. 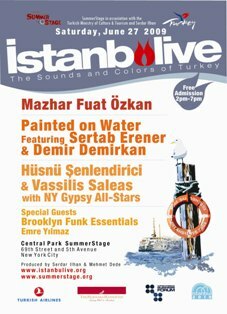 Also performing will be guitarist/singer/songwriter Emre Yilmaz and the eclectic Brooklyn Funk Essentials. BFE’s 1998 album In the Buzzbag, which also featured Hüsnü Senlendirici and his band Laço Tayfa, is considered an album ahead of its time, a landmark in the fusion of Eastern motifs with funk, reggae, hip-hop, Latin and acid jazz.